In large bowl, beat cake mix, root beer, oil and egg whites with electric mixer on low speed 30 seconds, then on medium speed 2 minutes, scraping bowl occasionally. Pour into pan. Bake 32 to 36 minutes or until toothpick inserted in center comes out clean. Cool completely in pan, about 1 hour. Stir root beer concentrate into frosting. Spread over cake. Just before serving, sprinkle with crushed candies. (Candies will begin to melt 1 to 3 hours after sprinkled on cake.) Store loosely covered. For maximum cake height, keep baking spray off the sides of the pan. The cake will climb the sides of the pan better. 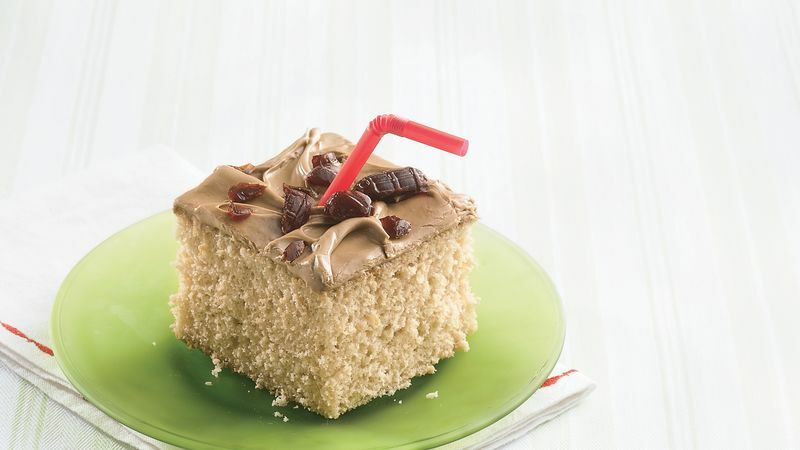 For a fun soda fountain touch, insert half of a plastic straw into each piece of cake.